I definitely belong to the latter group, although with red hair people tend to think otherwise. I love St. Patrick's Day. This Saturday you'll find me watching the Chicago River being dyed green (somehow I've never been before!) and enjoying a few libations. Do you celebrate St. Patrick's Day? Haha - hope you have a fabulous St. Patrick's Day Kristina! Haha too funny! 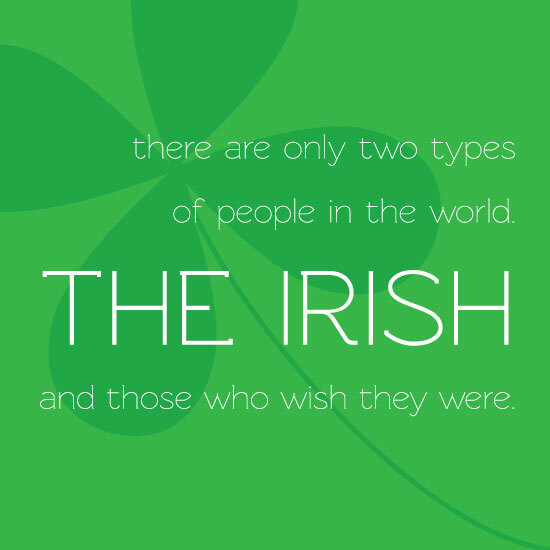 I think my Italian family would beg to differ ;) Hope you have a fun St. Patty's day! This is very true! As an Irish girl myself, EVERYONE wishes they were Irish on St. Patty's Day! cute quote! Cant wait for St. Patricks Day! Have a good one! I thought it was Greek? Just kidding. Great quote. cute quote! I don't really celebrate it but when I was younger definitely was all about going out for some Guinness + Green beer! I haven't before really, but I truly am Irish so I should! I have never really celebrated St. Patrick's Day before. My friend is wanting me to go to a parade with her this year. I would love to have red hair. I'm not Irish either. I would love to have red hair. Last year I only lasted until about 1pm for Chicago St. Patty's Day. Let's see if I can do better this year.